North Conway, NH Shopping in the heart of Mt. Washington Valley in the beautiful White Mountains of New Hampshire is a shopper’s dream come true. There are hundreds of stores, fine art galleries, and factory outlets to shop in, in the North Conway, Bartlett and Jackson, NH, areas for clothing, artwork, outdoor, mountaineering and golf equipment, and NH-made gifts and crafts. From Corning Revere, Waterford, Royal Doulton, Wedgwood, Lindt Chocolate, The Christmas Loft, House of Jerky, the North Conway Olive Oil Company, Beggars Pouch, Stonewall Kitchen, Zeb’s General Store, Ski & Snowboard Outlet, Banana Republic, The Gap, LL Bean, International Mountain Equipment, even pet supplies, etc., you’ll find everything you need and at great discounts. 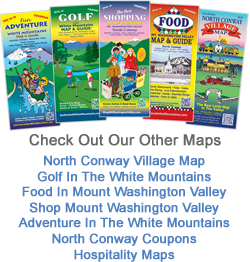 For even more savings, check out the COUPONS section of the map or at NorthConwayCoupons.com. While in Mt. 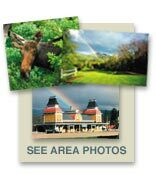 Washington Valley, you’ll also enjoy North Conway restaurants, pubs, live entertainment, and lodging at more than 150 Valley hotels, country inns, and bed and breakfasts. There’s skiing at Attitash, Cranmore, Black, Wildcat, Bretton Woods, King Pine, Shawnee Peak, and Sunday River, and XC skiing at Jackson Ski Touring and the Mt. Washington Valley Ski & Snowshoe Center in North Conway Village and Intervale, NH. Whitaker Woods has many miles of trails to mountain bike, snowshoe, or cross country ski. The new winter craze of Fat Tire biking is all the rage in the mountains towns of the White Mountains. All this is easy driving from Portland, Maine, Manchester, NH, and Boston Massachusetts. Our 4-season, Mt. Washington Valley Calendar of Events will keep you coming back to our quaint New England Villages for years to come. Check out HospitalityMaps.com for more information and area maps.